Hate to say it but only resolution is to trade vehicle. Pretty disappointing from Gmc. 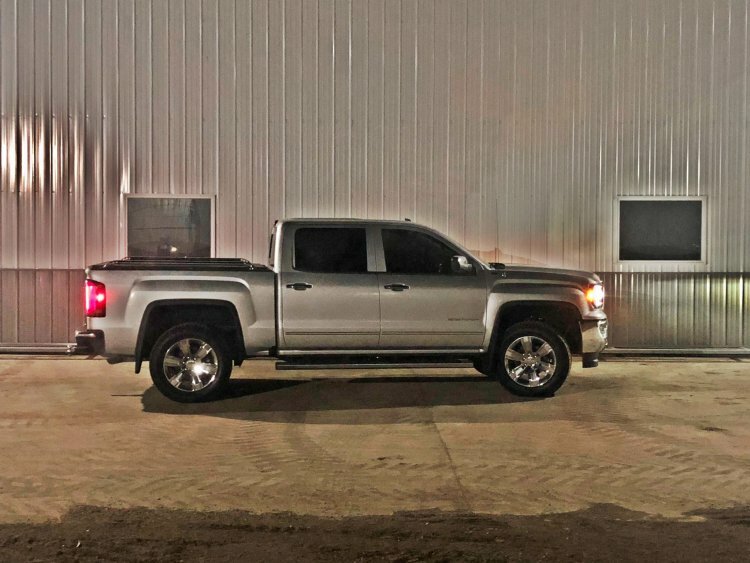 2017 Sierra z71 everything ive done so far. What next? I know I’m the minority but I think the chrome bumper makes everything else pop! I had issues with my Denali and went to a slt. Planned on color matching bumper but for now I am liking the change! I’m a silver guy but if not silver would for sure be white. Very nice! Traded in an 18 Denali for this 18 SLT. Had vibration issues that they just couldn’t figure out. RC 2” level with 275 60 2 Hankook tires. Happy with the look and even happier with the ride! No more vibration! Here’s my 18 SLT I picked up. Kept it simple. Did a rc 2” level and 275 60 20 Hankook tire and a little window tint! Traded in a 18 Denali that I had all sorts of vibration issues . Couldn’t be happier! They won’t charge to look at it but will say it’s within normal range. It is frustrating. Very frustrating to spend that kind of money and have it hit or miss. Not that I want to drive around in 4a all the time. But certain conditions I would leave it on if it weren’t so loud. Especially frustrating that my dad probably paid 10 grand less for his and it’s perfect. Hopefully it works itself out of it. I’m sure dealer can’t do anything. I have a 2018 Denali. When in 4 wheel auto it has a loud growl to it. My dad has a 2018 slt and in 4 wheel auto you can’t tell it’s engaged. Anyone else have the described growl? If so can anything be done? Any road vibration at high speeds? Do you have any rubbing issues? I currently have a 285 55 hankook on my truck and sometimes wish I had more tire. I have 2” leveling in front. That looks really good. How does it drive at 75-80 mph? Would you go 285 60? Would you go 285 60? I’m curious if the dealer checked your front drive line? Took mine off and brought it in to a drive line place. It was so bad they couldn’t balance it. They made me a new one and all problems went away. Less than a year old. Finally got all my issues fixed. 90% of my problem was in front driveline. Brought it to a drive line place and there was a curve in it. So much so they wouldn’t balance it. (GM) says it’s within range of normal 🙄. Had them build me a new driveline. The other 10% were in the tires. I had 295 55 toyo. Went to a 285 55 hankook and all my problems went away! Was thankful the dealer picked up entire bill except tire exchange. Just thought I would throw it out there if anyone else comes across this. My dealer found another truck on their lot with same drive line issue after I told them about mine.